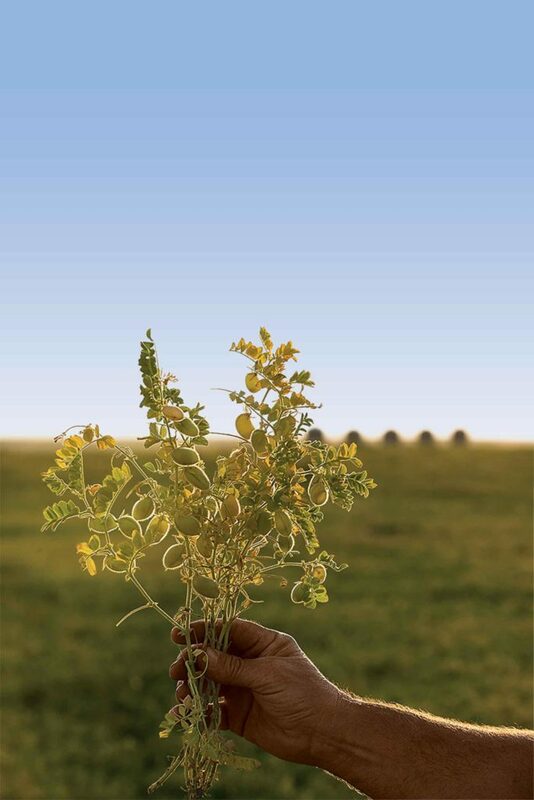 Pulse crops bring prosperity to northern Montana farmers. As one traverses the northern tier of Montana, the sun can be seen glinting merrily off shiny new grain bins and late-model equipment. The Hi-Line, as it’s known, is a region with a rich tradition of wheat production. But wheat isn’t what’s on the move as harvest kicks into gear in late summer and trucks start their endless rotation through the elevator scales. In fact, with markets plummeting for wheat and supply plentiful, a significant portion of last year’s crop can be found still reposing in open piles at grain marketing facilities. Twenty years ago those piles of year-old wheat would have dampened the spirits of those headed to the fields. But wheat didn’t fund the prosperity implied by the well-kept, well-equipped farms of the region. The heroes of farm profitability for the last two decades have been pulse crops. Saving grace. “I raised my first crop of lentils in 1993 after coming off 10 years of drought in the 1980s,” says Grant Zerbe as he watches a bumper crop of wheat feed into the header on his farm near Frazer, Montana. “We finally had the moisture to raise a wheat crop in 1992, but so did everyone else. Prices tanked, just like this year.” Though his yield monitor is tracking 50-bushel wheat, Zerbe expects to just break even. It’s not a disaster, though, because Zerbe has a few aces in the hole: high-value pulse crops including yellow peas, green peas, chickpeas, and lentils. “We’re cutting 30-bushel peas for $6 per bushel, so there’s profit there, but the lentils and chickpeas will be the cash cows on the farm this year,” he says. 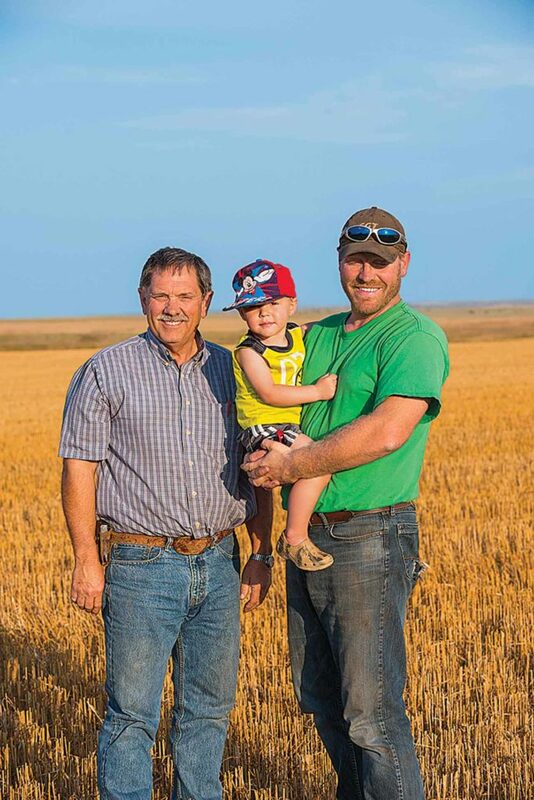 Grant Zerbe hopes pulses can keep his son, Clayton, and grandson, Micah, farming. Shifted fate. Zerbe was one of the first in the region to raise pulses. His traditional wheat-fallow rotation with a side of drought was painting his farm a bleak future, so he looked to his neighbors in Canada who were having some success with pulse crops and decided to give them a try. His first crop of lentils wasn’t superb, but they grew and so did Zerbe’s enthusiasm for his new venture. By 1999 he had adopted no-till farming practices to conserve moisture and was seeding almost every acre every year. “Pulse crops use about half the moisture of wheat, so it’s almost like still having fallow in the rotation,” he says. But with benefits. Pulses fix nitrogen from the atmosphere allowing Zerbe to cut down on fertilizer costs. Plus with no-till and continuous cropping he’s seen his soil health improve including more soil organic matter and better soil structure which work together to draw in and save more of their scant moisture. The diverse rotation has helped eliminate or greatly reduce a number of pest and disease issues, too. “We don’t really have to worry about sawfly anymore which used to be a major and devastating pest for us,” Zerbe says. “We also see a lot less fungus in our wheat. There’s so many things a pulse rotation does for your farm.” All add up to a better bottom line for Zerbe who, like so many others in the region, once teetered on the brink of failure when growing wheat alone. Markets weren’t always plentiful, more like hard to reach. Zerbe and others in the area initially trucked their pulse crops to elevators in Canada. Grain marketing facilities soon stepped to the plate. “We saw more farmers wanting to include pulses in their rotation so we made investments to provide what was needed,” says Jeff VanPevenage, president and CEO of Columbia Grain. The company researched markets worldwide and saw lots of opportunities and niche markets, especially for high quality, clean product. Pulse crops are growing in popularity in the United States as diet-conscious consumers seek out healthy eating options. Columbia Grain offers both cleaned or bulk products. “Some areas of the world, such as India, have good cleaning facilities while others only buy cleaned product. We’re able to serve both so we can sustain a strong market for growers even when individual markets are bad,” VanPevenage says. Pulse crops are protein powerhouses and a staple food in much of the world, keeping them in constant demand. “You can take a lentil, put it in boiling water and you have a 22 percent protein soup,” Zerbe says. “Pulses are crops that can feed the starving masses. You can’t do that in third-world countries with beef or wheat.” There’s also growing interest in pulse crops in the U.S. “Millennials are into healthy eating and pulses offer a lot of benefits from being low glycemic to a great source of protein. We’ve seen the U.S. hummus market increase substantially.” Zerbe hopes to see domestic and overall market growth continue through awareness efforts such as the 2016 U.N. International Year of Pulses. “It’s been really exciting to see how pulse crops have grown the viability of our region,” Zerbe says. Refugee gardens help farmers rebuild in America. No-till, markets, and advancing hybrids have corn popping up in some pretty dry places.